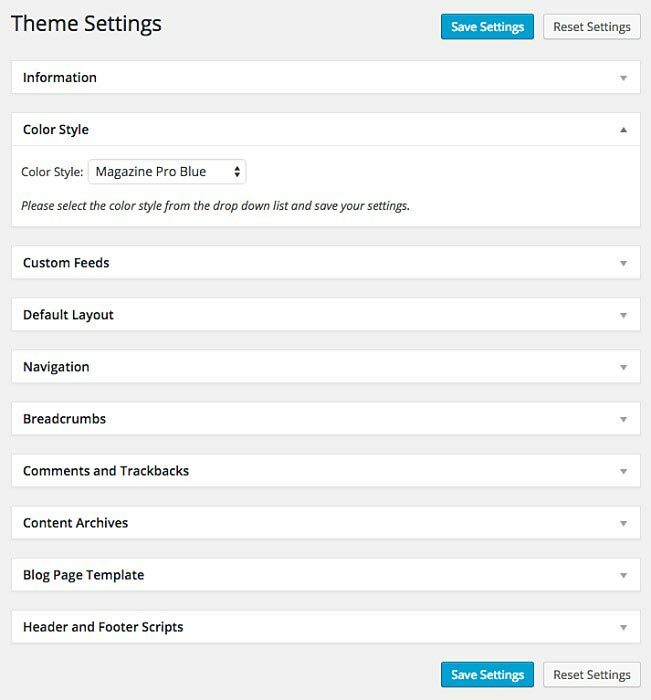 Want to know if the Genesis Theme gets the EntrepreneursGateway.com’s Award for being the best WordPress Theme on the Market? This review will tell you just that! We’ll look at how easy is it to use? What are the cool features it has to offer? The EntrepreneursGateway.com team have put it through its paces, testing every aspect of what’s important to you and your website. In this review, we’ll have a look at why Genesis is still one of the best in the business and what makes it so unique. Genesis is very affordable. If, however, you are using Genesis for the first time, there is a package available whereby both Genesis and a child theme, can be bought for approximately $99.95. 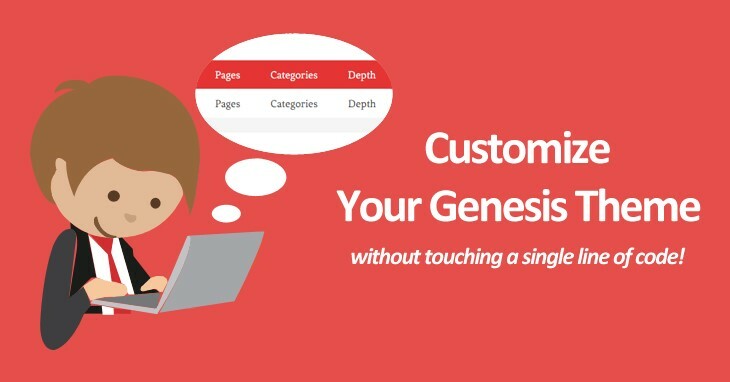 Genesis is extremely easy to use. Even those new to working online can have it installed and running on the WordPress website in a flash and even editing is a breeze. 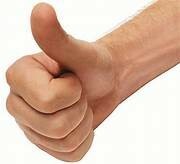 One word – fantastic !! Once the framework has been purchased, and you become a Genesis user, there is unlimited access to support for a limitless number of sites that utilize the framework. Is Genesis - The Right WordPress Theme for You? If you are in the process of learning about WordPress, themes and plugins, let’s delve deep into the origins and find out exactly what Genesis is. 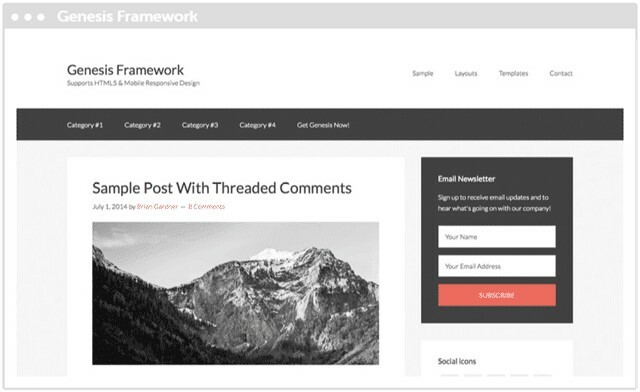 Genesis is a premium theme framework that works with WordPress (remember to use open source WordPress and not the WordPress.com websites). CopyBlogger Media created the company, called StudioPress, who in turn produce the software. Genesis themes can be used as standalone parent themes, but users will benefit most by incorporating it into a child theme. At present, within StudioPress there are well over 40 professionally built child themes available. This doesn’t include all of the third party child themes. The Genesis framework, positioned on top of the WordPress’ core code, creates a secure search engine optimized base to build your WordPress site. The actual installation of the Genesis framework alone doesn’t make for an aesthetically appealing website. That is where Genesis child themes come into play, as it sits above the Genesis framework and adds the visual enhancement. You may be asking yourself, do I really need two themes? The parent theme can work as a stand-alone theme, but you’ll notice that the styling is generic and very clean cut. The main advantage of using Genesis, combined with a child theme, is that it will give your WordPress site a more unique look and feel. 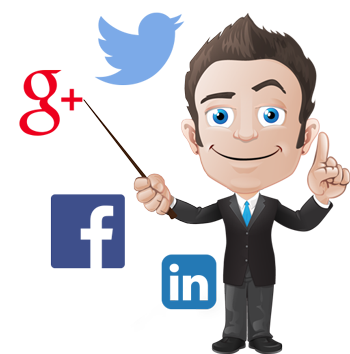 As I briefly outlined earlier, child themes are all about the visual appearance and design of your website. It gives you the ability to customize, including logo and branding colors. If your tech knowledge is relatively good, this can be done manually inside the style.css file, or you could use a plugin called Genesis Design Palette Pro. In this section, you’ll find out if Genesis is easy to use. I know you won’t want to be spending hours setting things up and trying to find things on their dashboard. So, to begin with a StudioPress theme comes in two parts, which are: The Genesis Framework and a child theme. 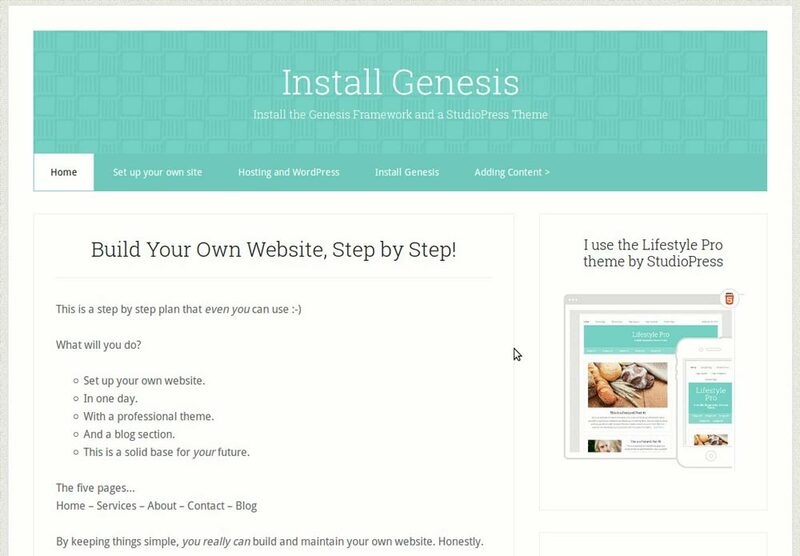 So, for example, if I wanted to install the Lifestyle Pro theme by StudioPress I would first need to install the Genesis Framework. The Genesis Framework doesn’t need to be activated but must be installed as one of the themes. When you purchase a StudioPress theme, you are given access to the download section of their website. Simply log in and click on the large blue download button. Once you have downloaded the Genesis Framework and the theme, save them to desktop. They need to be located somewhere which is easy to find so that they can be uploaded onto your WordPress themes directory. NOTE: DON’T UNZIP the files – WordPress will automatically do this for you. Now when you have Genesis and a StudioPress theme onto your desktop, log into WordPress. Then press the ‘enter’ key on the keyboard. Punch in your WordPress username and password. The WordPress dashboard should now be displayed. If not, just hover the mouse over the icon shaped like a little house on the top left-hand side of the screen and choose ‘dashboard’ from the drop-down menu. At the top of the screen search for, Themes > Add New. Click this link. Go to your desktop and select ‘Genesis Framework’. DON’T! Activate the Genesis Framework. Click on the link that says ‘Return to Themes Page’. Again look at the top of the screen for Themes > Add New. Go to the desktop and select the StudioPress theme that you want. Click on the ‘Open’ button. This time Activate the theme. 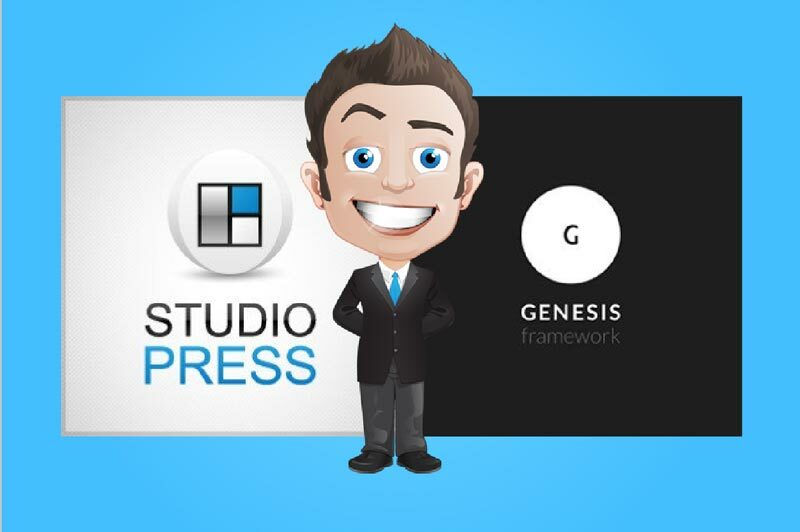 And that’s how easy it is to install the Genesis Framework together with a StudioPress Child Theme. To make things easier, I have included the screenshots from the Genesis installation video. 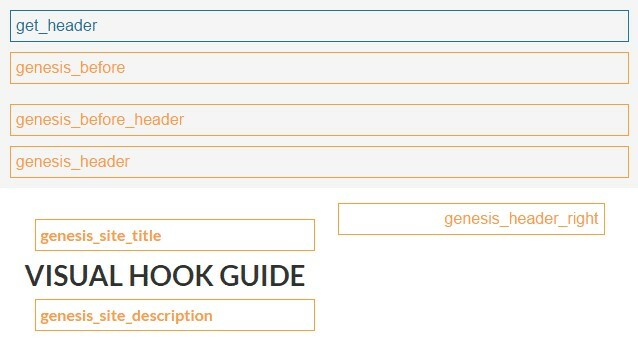 Layout options– Genesis is extremely easy to use. Even those new to working online can have it installed and running on the WordPress website in a flash. Even editing is a breeze with Genesis. All Genesis child themes come complete with their own settings, which means that making changes involves the simple tick of a box. It’s easy to; input necessary information, insert ready-widgets into the footer and column section, and even change slider settings over – it is that simple. Have a look at the screenshot below to see the Genesis theme setting option. Gone are the days of having to fiddle around with bits of code, theme files or anything else for that matter!! Changes to color style, navigation, default layout, blog page template, and breadcrumbs can be made by clicking on the layout options. Genesis is reliable and robust and offers quality and reliability in WordPress themes, which is why it ranks right at the top. Many of the Genesis themes are so lightweight that loading time is swift with very few glitches or issues. When setting out to create a website that is user-friendly, this is an important factor to consider. The great news is that all the StudioPress child themes, together with the Genesis framework are fully optimized for mobile responsiveness. Simply put, your WordPress site will look amazing whatever device it is viewed on, from tablet computers to Smartphones. But, how important is this? In today’s digital world, it really is important to have a website that is mobile responsive. 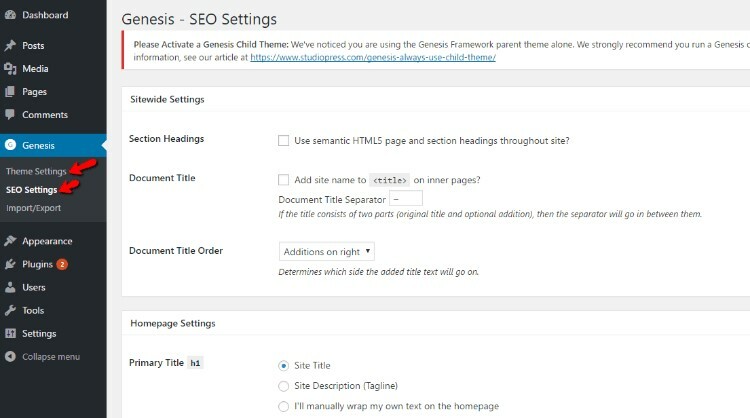 Now that we have outlined some of the significant factors that need to be considered when buying the Genesis theme framework, let’s have a look in more details at what Genesis child theme customization is. Right, now let’s discuss Genesis’ features. You want a theme that’s going to be amazing right? Genesis is easily expandable by adding plugins to the Genesis powered WordPress site. Those who have knowledge of HTML or CSS can enhance the uniqueness of the Genesis site’s functionality and design. What dedicated plugins are offered with Genesis? Listed below are some of the plugins, with what they offer. Genesis Simple Hooks – Access to more than 50 action hooks, inside of the Genesis theme, which helps to add functionality to your WordPress site, without the need to install extra plugins. Genesis Simple Edits – Enabling modification of three of the most commonly edited areas within the Genesis themes: the post-meta, the post-info, and the footer. Genesis Design Palette Pro – Enabling the Genesis child themes background colors, font style, color and size, padding and margins to be effortlessly styled. Genesis eNews Extended – Enabling an email signup form to easily be added to your sites footer, homepage or sidebar. Genesis Extender Plugin – A third-party plugin created by CobaltApps, which allows even more control over the customization of the entire child theme. Now that I have outlined the Genesis framework, let’s look at why you might invest your hard-earned money into a Genesis theme. What makes the Genesis framework so unique? There are, of course, many reasons as to why the Genesis framework is so popular and why it ranks so high in the WordPress ecosystem. Below are some of the reasons this framework has become the number one choice for many different types of developers, and website owners. Genesis is well coded, which means that making underlying code changes is relatively straightforward. Because the Genesis framework uses clean code while building the framework, and the child themes, it makes it an extremely developer friendly platform. Another feature of the framework, that helps to boost its developer-friendly credentials, is the use of hooks. With names such as genesis_before_header and genesis_after_sidebar_widget_area the use of hooks allows you to input the custom code exactly where you want it within your theme templates, as shown below. Hooks enable you to generate separate PHP function files, within the theme folder. These house the specific code needed to add the required element to your site. They then instruct the theme to implement the same function, in the appropriate location. This is advantageous, as it means that code can be created for the new functionality once, but can then be hooked into the theme in various locations. If the new feature needs updating, editing is only needed in one place, and the updated version will be implemented when the theme next loads. Often within StudioPress, Genesis child themes come numerous skin color options; red, green, blue, etc, for altering the color of the overall site. What isn’t given, is access to the granular controls, which modify the individual aspect color themes. These changes can be made by editing the underlying CSS stylesheets, or by installing a third-party visual editor such as the Genesis Design Palette Pro plugin. What makes the Genesis framework so attractive, is the vast amount of child themes available. Aside from all the other positive aspects that the framework offers, such as developer friendliness, support, the enthusiastic community and of course value for money – the child themes themselves are usually enough to encourage WordPress users to become Genesis ones. Once the Genesis Framework is installed on your WordPress site, you can begin using any one of the child themes available to the framework. 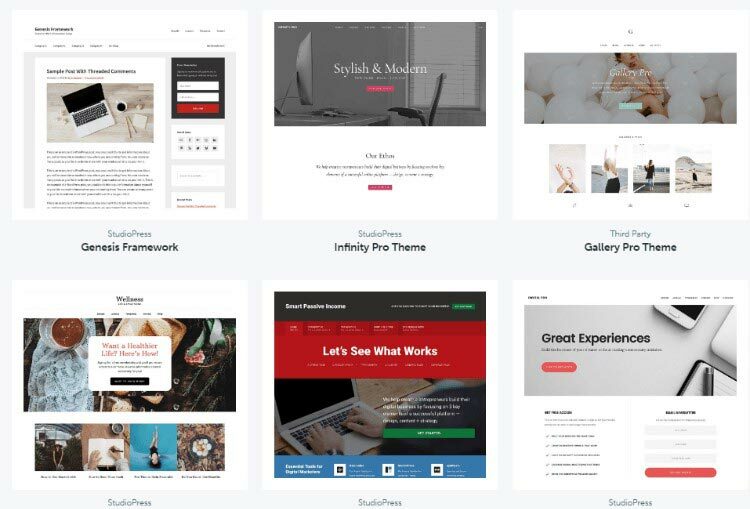 Because these themes use the features, core code and functionality of the framework, this allows the user to build whatever website they wish, using WordPress. Naturally, users can create bespoke child themes by using the template sample supplied with the framework. For those preferring an out of the box option, Genesis child themes have plenty of fabulous looking themes, all raring to go. Once both framework and child theme are uploaded, the child theme must be activated, leaving the framework untouched. Once a child theme has been activated, a new menu item is displayed on the menu dashboard sidebar, with the title ‘Genesis.’ This is where access to all the theme settings is housed. Both the Genesis framework and child themes are renowned for their SEO credentials, with an impressive set of SEO options included within the framework. 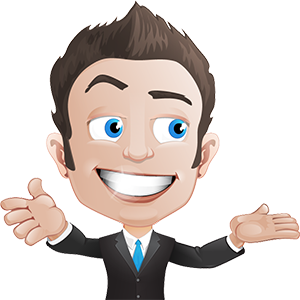 If, however, you choose to install the WordPress SEO plugin by Yoast, then the SEO features within Genesis will be deactivated, and the free plugin features will be utilized instead. Within Genesis is the ability to both import and export site settings. Using this tool generates a data file, which can then be downloaded to your PC for importation to other sites running on the framework. When customizing a website that uses the Genesis framework, many of the options available will be dependent on what child theme was used. 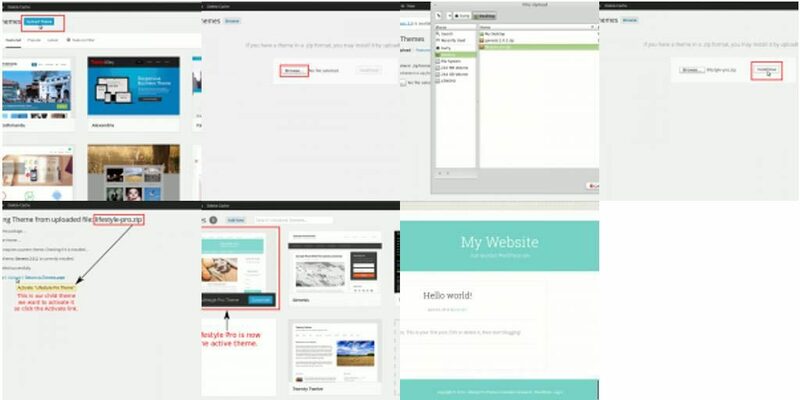 Many StudioPress child themes (the Genesis creators), usually enable changes to the theme appearance via the WordPress Customizer tool. The beauty of the WordPress theme customizer is the live preview, offering full transparency over changes. You may have several page templates, or custom widgets available, depending on the chosen theme. Some niche child themes include extra features, which can be added by plugin installation, rather than being hard-coded into the theme. It’s straightforward to set up a WordPress website as the child themes are so simple. I’d like to talk about Genesis child theme customization in a bit more detail. There are two ways of looking at this. If there is no limit to your budget, then you could pay for a developer to personalize, or even create, a child theme unique to you within the framework of Genesis. On the other hand, if budget is an issue, then it’s sensible to use a premium WordPress plugin, such as the Genesis Extender plugin or Genesis Design Palette Pro. Either one of these will make personalization of your Genesis site possible. The Genesis framework is thought to be the WordPress standard for the industry. Quick recap of the Pros and Cons of the Genesis Framework so far? 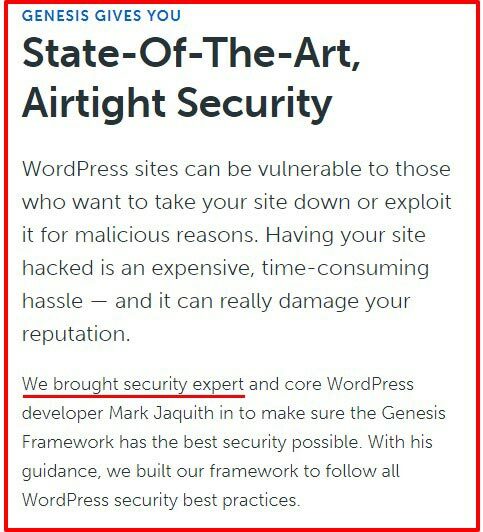 You want a WordPress Theme that’s going to make you feel secure against any threat out there. Get complete peace of mind that your website won’t experience any security threats, any downtime as a result, or any loss of data. How did you do Genesis? This is an area that should not be scrimped upon, more so, if you are trying to build up a business. Well, the good news is that Genesis has this built in. Both the Genesis framework and every child theme comes coded, with security at its forefront. When this is combined with your security measures, it becomes a robust, reliable website ready to fight off intruders at every corner!! And SEO, is that built in too? Well, some premium quality themes do not offer built-in SEO tools, Genesis, however, does. They may not be the most comprehensive, but they are sufficient enough for no additional SEO plugins to be required. With this in mind though, for SEO optimization, it is recommended to use a third-party plugin SEO such as SEOPressor Connect or WordPress SEO by Yoast. StudioPress really does offer excellent support. Premium support is provided to lifetime members, whenever needed, and lifetime updates are included on all purchased themes. Once the framework has been purchased, and you become a Genesis user, there is unlimited access to support for a limitless number of sites that utilize the framework. With detailed setup instructions included in each of them, getting the site up and running, with the desired appearance, is simple. Within the StudioPress website, is a whole host of tutorials and useful snippets of code, together with external resources to help with any changes to structure or appearance of the site. Customers are also able to open support tickets via their account area. In general, on a weekday, customers should expect a response within 24 hours, with a 48 hour turnaround on holiday and weekends. Now for the all important question – Price.. The best part is that Genesis is very affordable. 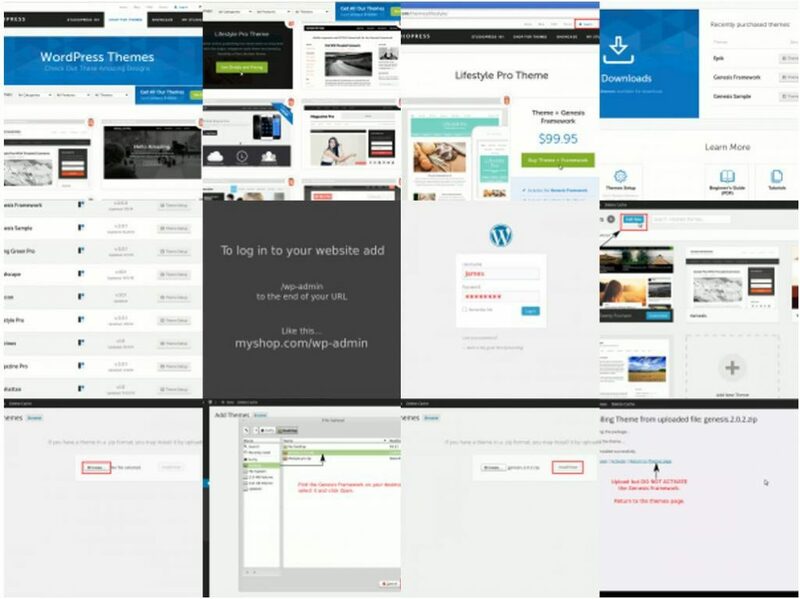 When investing in a premium theme, there is one big thing to consider. Many theme creators will incorporate some form of the set up annual membership fee within their site; an example is Thrive Themes. 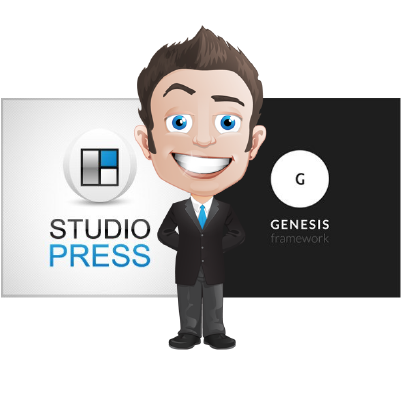 With StudioPress, however, by purchasing a Genesis theme(s), you instantly become a lifetime member, which means there is no need to pay an annual fee. It is possible to find cheaper themes, however, in my opinion, I would rather pay a little extra for a premium quality reliable theme. This is way easier on the purse strings than paying a professional web designer. 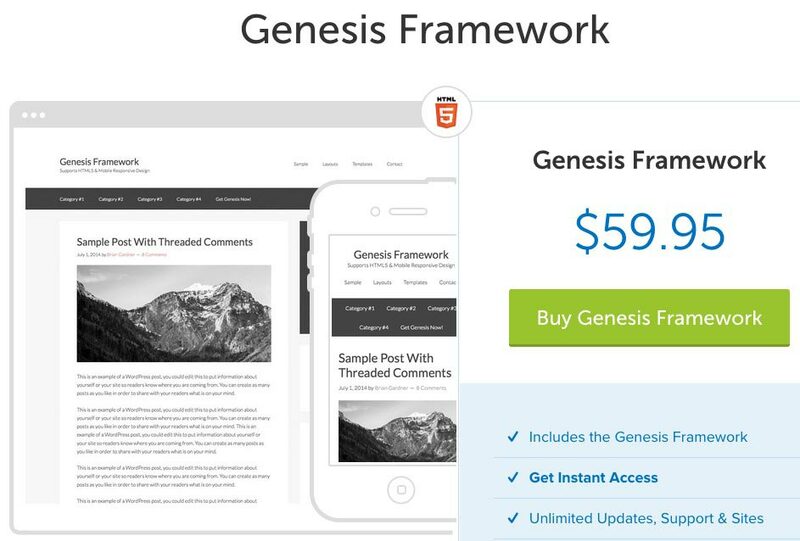 Genesis Framework costs $59.95 and seems to have remained at that price for years. If you wish to invest in any child themes, it’s worth remembering that these will cost extra, and the rates are variable. If, however, you are using Genesis for the first time, there is a package available whereby both Genesis and a child theme, can be bought for approximately $99.95. With every Theme, you will find that there will be ones best suited for some, yet not for others. Each one is different! Hence why there are so many! Genesis is great for those on a budget as it is very affordable. It is possible to find cheaper themes, however, in my opinion, I would rather pay a little extra for a premium quality reliable theme. This is way easier on the purse strings than paying a professional web designer. It’s also worth remembering that if you are using Genesis for the first time, there is a package available whereby both Genesis and a child theme, can be bought for approximately $99.95. Genesis is perfect for beginners who are looking for a well coded WordPress Site, which together with its easy installation, makes it an ideal choice for users of most levels. 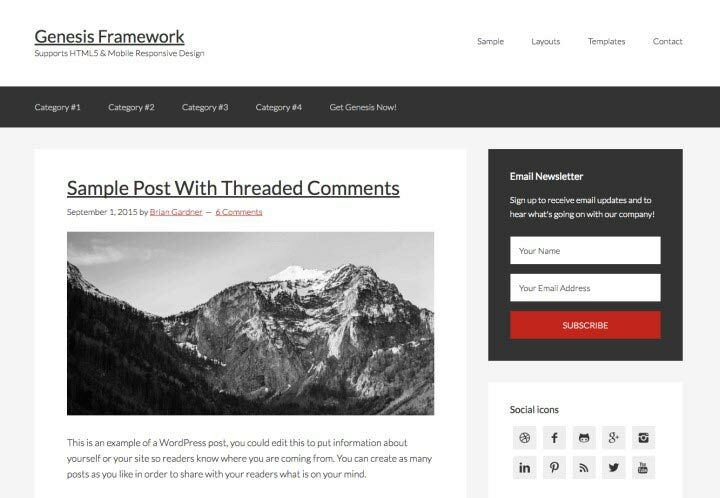 It offers a well-supported and well-documented WordPress theme that also ensures that their website looks professional and of high quality- all with a minimum of clicks. The Genesis Framework is well known for its quick loading code, and its SEO focused make-up. 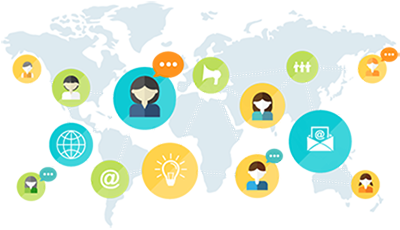 This ensures that the users’ website will be easily found on search engines and that the site itself will be extremely user-friendly. The third group of users, is somewhere between the previous two, in that they aren’t quite developers but are capable of using a fairly intricate Genesis child theme. They may choose to customize their chosen theme, and might even learn some coding skills en-route !! As mentioned previously, due to the availability of the Genesis customization tools available, many non-developers can change the overall look of their website, without ever having to edit any coding. AND, who isn’t it so good for? Users who may be disappointed with Genesis, are those who like using the drag and drop, beginner friendly website builders, such as X Theme, or Divi. They feel they are missing out on the features that the Genesis themes offer, as many of the improvements occur out-of-sight. Genesis is not as detailed as X Theme, or Divi, which offer a plethora of customization features. It does, however, give you control over the appearance of your site. 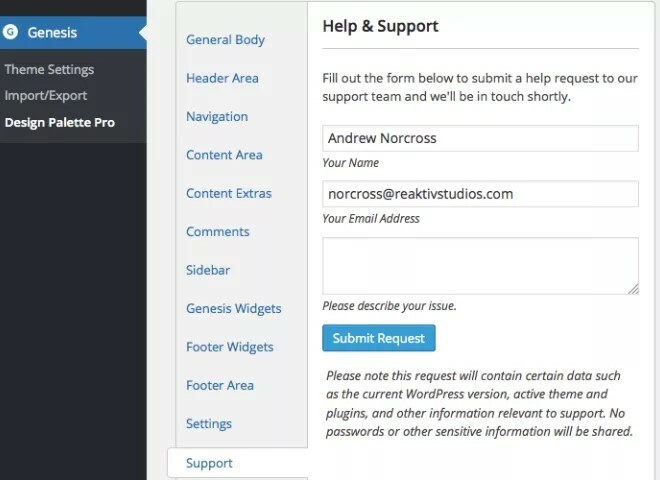 As outlined earlier, there are third-party tools available that can help to add a ‘website builder’ theme to the Genesis framework. One such example is Dynamik Website Builder by Cobalt Apps. Even those devoid of any coding knowledge can use this in a similar way to a Genesis child theme. The result being, the benefits of the Genesis framework, combined with the flexibility offered by other themes. 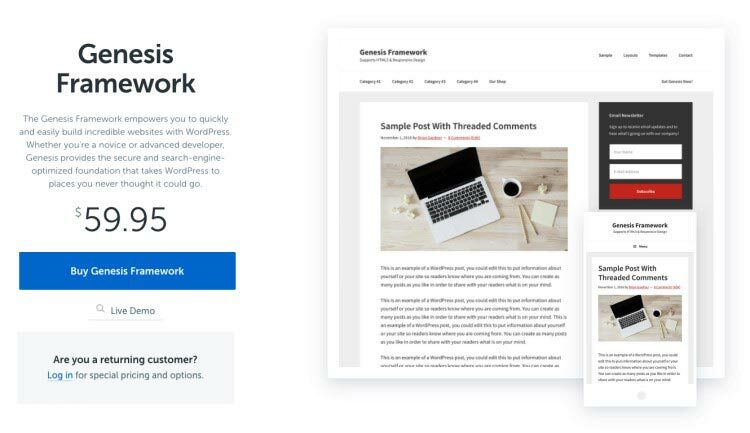 Our review outlined that there are several fantastic reasons as to why Genesis has been voted one of the most popular and respected theme frameworks for WordPress. For seasoned WordPress users and developers, Genesis provides a considerable amount of value. It can optimize your site in various ways and its clean, effortless framework, offers a foundation, from which any business can grow. The constant stream of the superb standard of Genesis child themes has helped to secure it as the go-to framework for both those looking for exceptional out of the box WordPress themes. This is even before mentioning their third-party child themes that have been developed elsewhere. For those looking for a firm foundation on which to grow their business from, the Genesis framework is a must. It must be remembered, however, that both the Genesis framework and their child themes lack some of the multi-functionality and feature sets that other premium bestselling WordPress themes offer. Instead, Genesis focuses on ease of use, simplicity, clean-cut designs, along with efficient and fast loading code. Site owners have the option to add more features via the extensive WordPress plugins library, instead of theme developers forcing them upon them. Genesis is an excellent choice if you are looking to change the functionality and appearance of your theme, and have no issue with using underlying code (be it directly or by a third-party plugin). I hope this review has given you some idea of whether the Genesis framework is suitable for your website/business. I wholeheartedly love using Genesis, and to those who are serious about moving their WordPress blog/site to a higher level, then I can’t recommend Genesis any higher. Are you going to purchase Genesis or are you already using it? Feel free to leave a comment below and we’ll see if I can help…. or check out the other reviews like Thrive Architect or Spacious!